I just realized I haven’t blogged anything since Lucy’s birthday, which was nearly 3 months ago. So! Recap time! 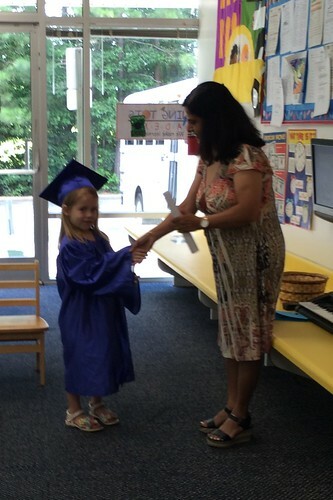 First, Lucy graduated from her pre-k program, and yes ok, it’s stupid to do the whole cap & gown thing for 5 year-olds, but this is the daycare where Lucy has been since she was 11 weeks old, and where Catie started going when she was only 2 years old. The girls may go there for the occasional track-out week, but other than that, we’re done there. It felt like the end of an era, that place has been such a big part of our daily lives for so many years. So I admit it, I cried. A lot. The kids got to hang out with their cousins, which they loved. (God bless my aunt Susie, who somehow managed five kids without murdering or losing any of them.) We spent a lot of time at our neighborhood pool. Like a lot. 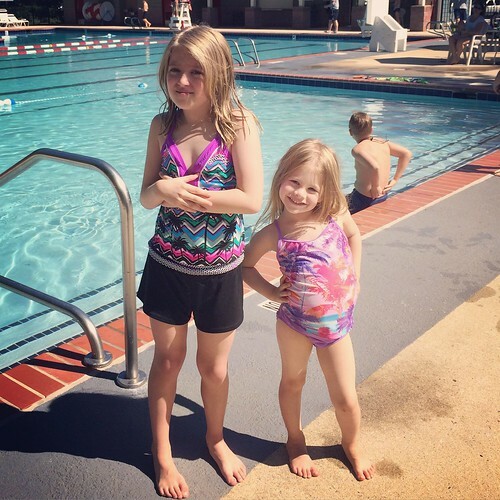 We’re at the pool pretty much every weekend that the girls are with me. Because the only way I can tolerate being outside during a North Carolina summer is if I’m submerged in water. 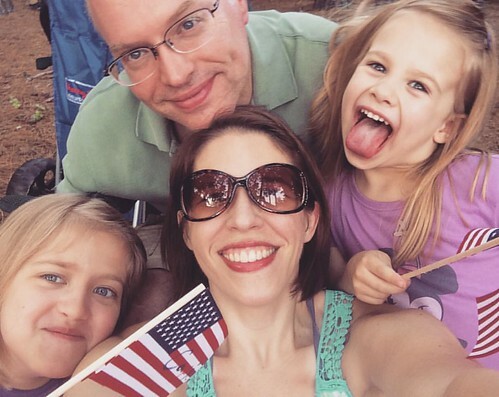 We went to see the fireworks on the Fourth of July. Oh! 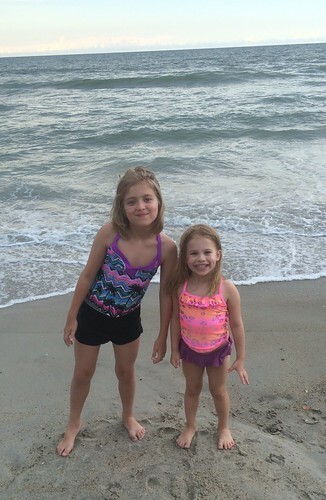 And my parents and I took the girls on an overnight trip to the beach. 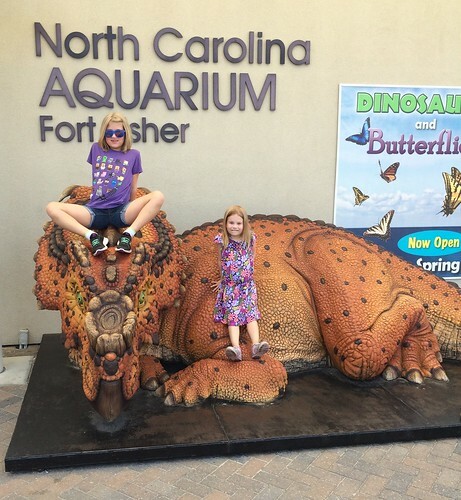 And we went to the aquarium at Fort Fisher, which was cool. Eh. Scratch that. It was the opposite of cool. It was like 95 degrees that day. The inside of the aquarium was fine, but all of the outdoor stuff – like the big dinosaur exhibit – was soul-crushingly hot. On our year-round school calendar, our summer vacation is basically the month of July, and that’s it. The downside is that it feels like there’s never enough time to do all the stuff we want to do. But overall, I feel like the 9 weeks on/3-ish weeks off schedule works out better for us. Just around the time kids start to get burned out on school, it’s time for a nice long break. And then on the flip side, just around the time they start to whine about being bored? Back to school you go! So, here we are. 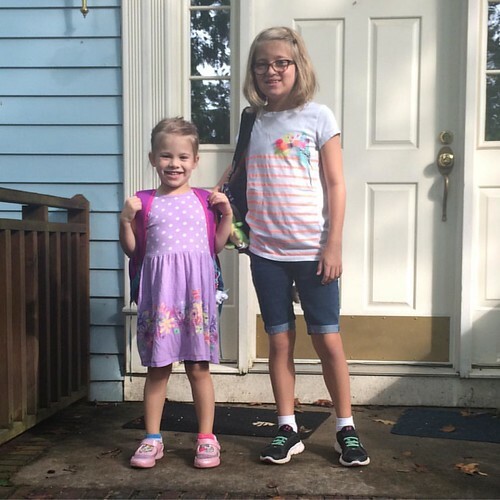 Kindergarten for Lucy, and fourth grade for Catie. Catie breezed into 4th grade like it was nothing. She’s been doing great, her two closest friends are in her class this year, and she’s been coming home from school and doing her homework without me twisting her arm to do it. I knew Lucy’s adjustment to kindergarten was going to be pretty rough, and it has been. It’s all new people (kids and adults both), new school, new routines. It’s a lot for any kid to process, but especially for Lucy, who tends to be really shy and quiet in new situations. And while she’s been great at school, I know she’s overwhelmed by all of it, because she comes home absolutely exhausted. We’ve had to scramble our evening routine, because now there’s a mad rush to get Lucy some dinner at “early bird special” hours (you want to eat at 4:30 p.m.? OK SURE! ), and then bathed and in her PJs, so when she inevitably falls asleep on the couch at 6:30… well, at least she’s fed and clean, so all we have to do is move her upstairs to bed. Everything outside of the kids is pretty standard. Chris is good, I’m good, our jobs are going well, we spend a lot of our free time going back and forth between watching election news (OMG y’all, this year) and binge watching different shows (just started season 2 of “Bloodline”). My parents are doing well. As for the pets: Spyro Jones is still around, Roxie is sweet and adorable, Beaumont got sick and scared us, but he’s on the mend now. He has hyperthyroidism and dropped a lot of weight really fast, but we have medication for him that should fix him up. So, all is well. If my sparse blogging trend continues, I guess I’ll post another update sometime after Thanksgiving. We’ll see. This entry was posted in Cate, Friends & Family, Lucy by Cindy. Bookmark the permalink.